This exercise is intended to add an unstable base to the single leg bridge with the toe tap. The wobbly foam roller increases ankle proprioception, which will improve balance. To do this exercise you will need a mat and a foam roller. Start by lying on your back with your knees bent and the foam roller underneath your feet. Lift one knee so that it is above the hip socket. Inhale into your belly and then exhale as you rock the pelvis to the belly button and the begin lifting the pelvis into the air vertebra by vertebra. 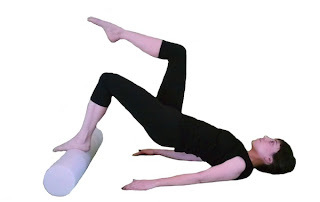 At the top allow the thigh to arc toward the foam roller and then float back up to the starting position. Repeat this 3-5 times and then gently lower the spine to the floor so that you can do the other side. Being very aware of the spinal articulation as you roll up will allow you to prevent hamstrings from cramping. Be sure to continue breathing during the entire phrase of movement. As your body continues to progress to exercises that require more exertion, the breath becomes even more important than before!